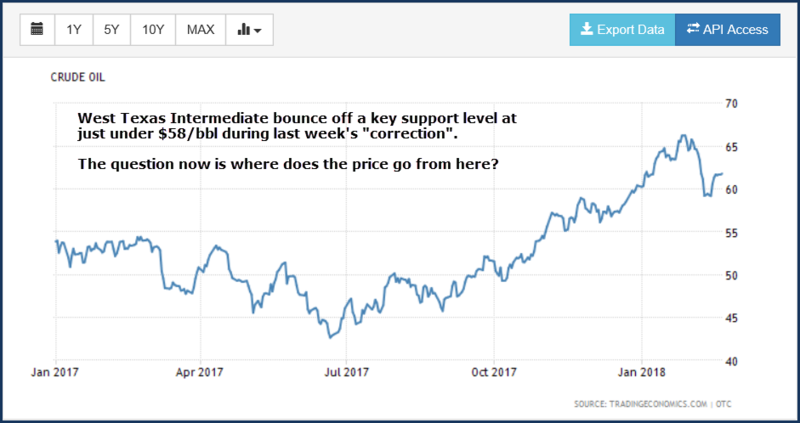 The price of West Texas Intermediate (WTI) crude oil, like the stock market, was overdue for a bit of a pullback or “correction”. After peaking at over $66/bbl on January 26, 2018 the front month NYMEX contract for WTI followed the stock market correction down to just above $59/bbl on February 13. By the close on February 16 it had rebounded back to $61.55/bbl. The fact that a key resistance level at $57.65 was not tested during the selloff is encouraging. WTI has been moving in a strong upward channel since last summer. Right now there is strong support at $57.65 and strong resistance at $66.70. A close above $67.00 should set up a test of $75.00 sometime in the 3rd quarter. At least that’s what the “tea leaves” are telling me. 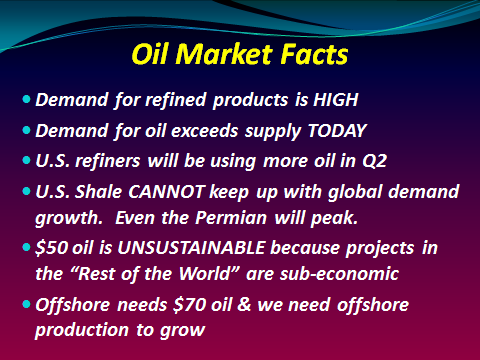 In my opinion, there are several “myths” or “false paradigms” that are holding down the price of oil. Myth #1: U.S. Tight Oil production can meet the world’s future demand for oil. U.S. oil production is on the rise. There is no doubt that vast improvements in horizontal drilling technology and completion methods have made harvesting oil from shale and other tight zones possible. U.S. oil production now exceeds 10,000,000 barrels per day; a level no one in the industry believed was possible at the turn of the century. However, U.S. tight oil production is still only 5% of the global oil supply. It is highly unlikely that U.S. oil production will be able to ever meet U.S. demand (currently over 17,000,000 barrels per day), much less supply the rest of the world. Myth #2: All Shale Leasehold is the same. The Permian Basin covers 19 million acres, however only a small percentage of the leasehold is considered “Tier One” for shale oil recovery. Upstream companies are rapidly drilling up their best acreage, a process called “High Grading”. Once they have drilled out the Tier One locations, it will be extremely difficult to maintain the pace of production growth that we have seen recently. From a well-level economic standpoint this is great since the wells payout quickly. However, we now have 100s of thousands of high decline rate horizontal wells online and another 20,000 new shale wells will be completed this year. Soon after the Tier One areas are developed, it will be mathematically impossible to drill enough Tier Two wells to maintain production growth. 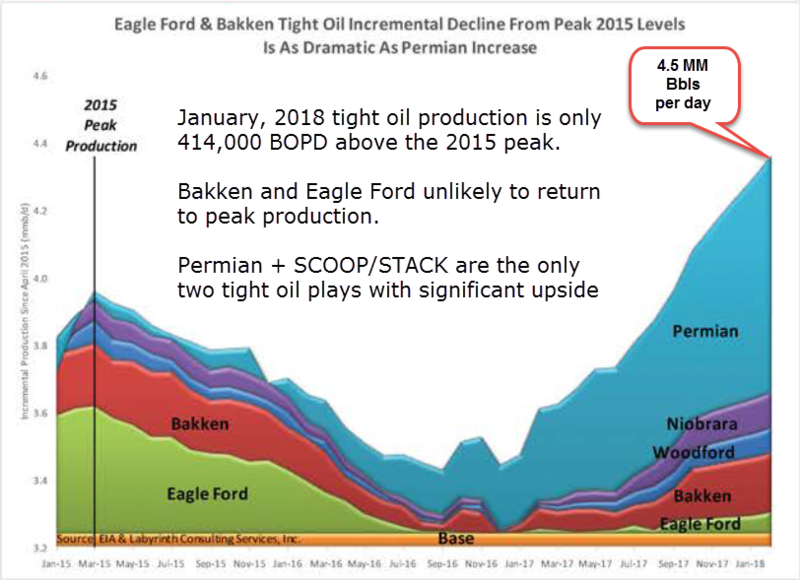 Most people that I talk to think the Bakken Shale and the Eagle Ford Shale have already seen their peak production. Myth #3: All oil is the same. I am expecting the problem of too much light oil production to get more press coverage this summer because (a) it takes more crude oil to produce summer blend gasolines & diesel and (b) there is a limit to how much light oil we can export. Myth #4: We no longer need conventional exploration. You could argue that this is the same as Myth #1. The thinking among investors is why waste capital on exploration in remote areas or on high risk drilling like deep water prospects when shale can produce all the oil we will ever need? The truth is that Non-OPEC / Non-U.S. oil accounts for over 45% of this world’s crude oil supply and it is now at risk of going on steady decline because so little capital has been deployed in these “Other Areas”. With demand for oil now increasing by 1.5 to 2.0 million barrels per day year-after-year, we are going to need lots of new supply outside of the shales. Myth #5: OPEC and Russia can flood the market with oil whenever they feel like it. • First of all it would be incredibly stupid for the cartel members to over produce again since they were the ones that suffered the most during the recent oil price collapse. • Second, OPEC may actually have very little production capacity beyond what they are producing today. If you’re considering investing in the Saudi Aramco IPO later this year, you may want to think about the paragrap:above. “When oil was over $100/bbl, did any new production come on in OPEC or Russia? The only area that saw a significant increase in oil production was North America. No other geologic province increased production. That tells you that if it were there, it would have been brought on to produce during a period of $100 + oil. It is the belief of TPH that any production outside of North America and big offshore projects requiring years to develop do not exist". I’m sure there are many industry experts that believe there are massive recoverable oil reserves out there, but TPH’s comment does give one pause. Myth #6: Electric Vehicles and Renewables will soon slow oil consumption. There is no evidence that this is going to happen anytime soon. The “Millennials”, defined as persons reaching adulthood in the early 21st century, have been brainwashed to believe we’d be better off without hydrocarbon based fuels and feedstock. Nothing could be further from the truth, but that is a subject for another time. Millennials believe that all educated people will be driving electric cars within a few years. They never pause to think about where all the rechargeable battery materials will come from or the massive changes that will be required to the power grid. If you are over 30, you may recall that biofuels were going to cause oil demand to go down. It never happened. We are going to see more electric vehicles in the future, but they won’t make a dent in gasoline and diesel demand for at least another decade. Wind and solar generate electricity and therefore are more of a threat to coal, but they still cannot compete with gas fired power plants. Like it or not, this world runs on oil. Nothing can come close to the energy density of gasoline & diesel and they are still relatively cheap compare to other transportation fuels. Fact: In April, demand for crude oil is expect to spike by over 2.0 million barrels per day. In 2017, demand for oil increased by 2.3 million barrels per day from the first to the second quarter. Last year, U.S. crude oil inventories were at the top of the five year range. Today, U.S. crude oil inventories are in the middle of the five year range. Facts eventually top Myths. • Global oil supply in January edged lower to 97,700,000 barrels per day. Compare this to global demand that IEA forecasts will exceed 100,000,000 barrels per day by the 4th quarter. 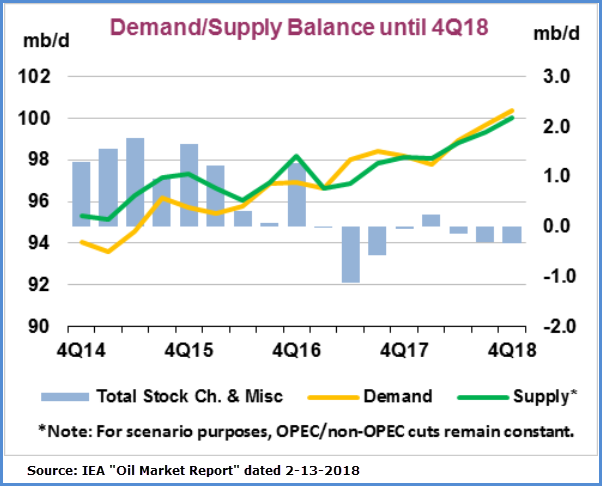 • IEA’s oil demand growth forecast for 2018 was raised to 1,400,000 barrels per day. In my opinion, when the actual data is in for 2018, demand will have gone up by over 2,000,000 barrels per day. Global GDP growth estimates just keep going up and GDP growth is the primary driver of oil demand. • OECD commercial stocks (crude oil and refined products) fell in December by 55,600,000 barrels, the steepest drop in over seven years. OECD stocks are now 2,851 million barrels, which is way below “glut” level. My prediction: When the U.S. refinery maintenance season is over in March, supply/demand statistics are going to turn VERY BULLISH for oil in April. While I agree with you on myths surrounding US shale oil production, I disagree that OPEC can’t produce more given the right oil price. Iraq alone could add more than 2 million barrels a day (mbd) by 2021/22 given the ongoing development of many discovered oilfields. Iraq has a large number of huge discovered oilfields that are waiting to be developed. A successful development programme could take Iraq’s oil production to more than 10 mbd by 2026/27. Moreover, OPEC could easily raise their production by more than 2.5 mbd at an oil price of $100/barrel or higher. But having suffered a real ordeal with the oil price crash in 2014, they are not going to flood the oil market again. 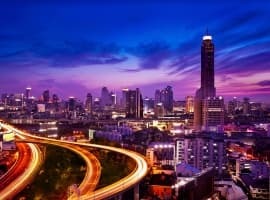 I totally agree with you that there is a huge hype about the impact of a wider use of electric vehicles (EVs) on the global oil market and the demand for oil. EVs will hardly make a dent on the global demand for oil. There will never be a post-oil era during the 21st century and far beyond. The oil price is heading towards $70/barrel and beyond during 2018 and could even touch $80 in 2019 buoyed by very positive oil market fundamentals and a re-balanced oil market. In my considered opinion, a fair price for oil ranges from $100-$130. Such a price will provide good revenues to the oil-producing nations and will enable them to invest in exploration and in expanding oil-production capacity. It will also enhance global investment in oil and energy projects and will enable major oil companies to balance their books and invest further in oil projects. All in all, it will stimulate the global economy and impact positively on it. America pays the oil at low cost and they don't have the high taxes we have in Europe. Something smells bad and such smell indicate to me that we in Europe are more evil than the Americans. If there are taxes that are too high and nobody can talk about it or no politiican will talk about it or do something about it then we need to realize that the only way to stop the evil taxes that make the oil cost more than three times the real cost it's the solution to reject oil as much as we can in the body and soul. If we all reject oil the bad people in power will pay the price and soon there will be no resources underground for them to play with. Basically, the solution is to think that if God does not want oil it is because the rich people are playing a dirty game and God will not defend us from the devil that comes with a bunch of taxes to steal our money because we love the evil rich man. 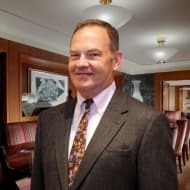 Taxes on oil are not being used to clean the air with special filters, there are no laws to force vehicles to have an air filter running as long as the engine runs, they don't use such money to clean the world from plastic waste therefore they do not pay anyone that goes around to pick up plastic. You can bet that into the oil tax there is the devil and nobody can stop such devil nor teach him anything good. The only solution is to reject oil as much as we have to. Thank you Dan for another intelligent and clearly written article. 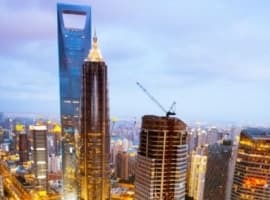 What happens if India and China start booming? Their oil consumption and appetite increase beyond the projected estimate. 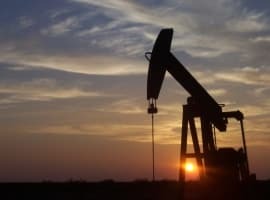 This could mean oil prices reach the highest threshold they&#039;ve ever seen. This is important with many countries (USA) now becoming more territorial and protection driven. $100-130 would be conservative numbers if this happens. A pessimistic view assuming no further improvements in technology what will change the picture and cost, and still assuming that OPEC/RUSSIA will idle whatever capacity they must to keep prices high and/or drive them to $70 plus. Maybe....but that&#039;s what everyone has predicted the last tens years. But heck, $70 a barrel oil is good. U.S. producers can make billions, produce more, invest more, improve the technology more, and renewables can certainly use the breathing space to continue to sharply lower cost and increase market share. The higher the price of oil at this time the sooner the day comes when oil and gas are not supplying most of the worlds energy, and in the meantime we might as well get that U.S. oil and gas out of the ground at a decent price. No sense sitting on it until its not needed anymore.